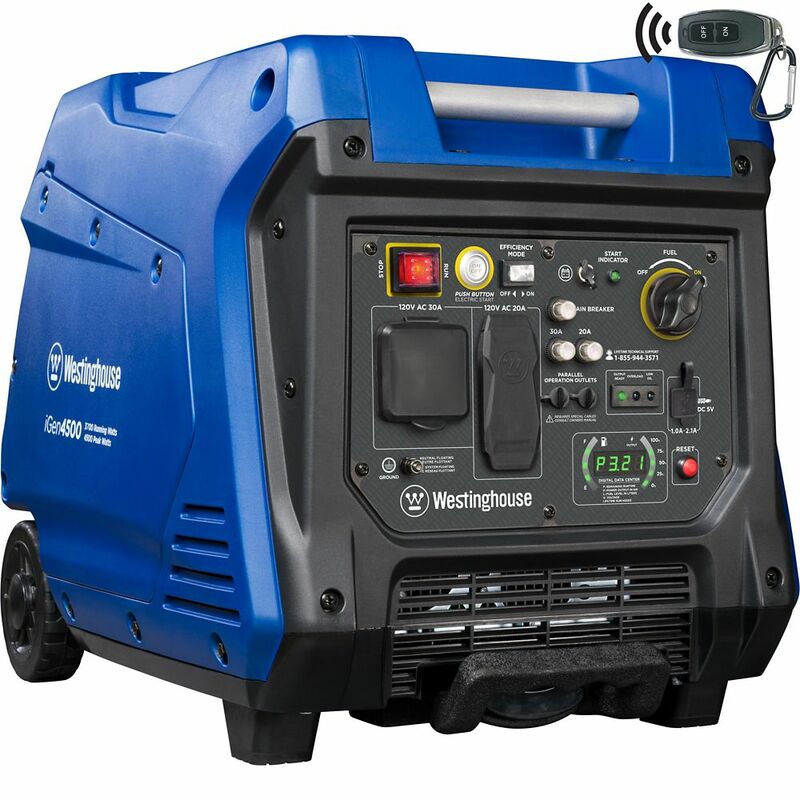 The Westinghouse iGen4500 inverter generator is a powerful, fuel efficient, and convenient solution to your portable power needs. The iGen4500 also has remote start, push-button start, and an LED display that lets you see the estimated remaining runtime, the power output, the volts, and fuel level. The iGen4500 features a compact design and an extendable handle, making this model much easier to transport than traditional generators. It features 120-Volt 20A household outlets, a 120-Volt 30A (TT-30R) RV-ready outlet, and built-in USB ports. This generator has variable engine speed and can run for up to 18 hours on 3.4 gallons of gasoline, saving you from repeated trips to the gas station. The iGen4500 also comes with a 3-year warranty and lifetime technical support. The iGen4500 digital inverter generator is backed by a 3-year limited warranty and Westinghouse's lifetime technical support. All Power's APG3106 is a 3500 watt digital inverter generator offered to you at an affordable price with many benefits: stable sine wave for sensitive electronic equipment, 42% less fuel consumption, electric push start for convenience, parallel oepration capability, quiet operation at 58dB. Additionally, it comes with free battery and heavy-duty locking caster wheels. This is a robust unit that will provide you with ease and convenience when needed. Generacs iX Series inverter technology takes the raw power produced by the generator and passes it through a special electronic microprocessor to provide clean and stable power, safe for computers and other sensitive electronic devices. Designed for life on the road, its durable, lightweight, compact design with built-in handle offers portable power for camping, tailgating, and recreational use, this item cannot be returned. The LIFAN ESI2500iER-EFI is part of our new 21st Century Energy Storm Electronic Fuel Injected (EFI) ECU computer monitored digital inverter generator series with digital display with self-contained diagnostic system and parallel connection feature which allows you to connect 2 units together to increase your power. Manufactured to high quality standards, this inverter comes equipped with a powerful 125-cc 4-stroke OHV fuel injected engine, a convenient electric remote start (key fob included), several safety and convenience features and special technology to reduce the sine wave distortion to less than 2%, to protect your valuable and sensitive equipment, such as laptops, computers, LCD and plasma televisions, surround sound systems, sensitive tools, video game consoles and cell phone chargers, all of which can be powered without the risk of damage. This unit is a perfect fit for camping, R-ving, tailgating, parties and events or general use around the house. iGen4500 Portable Inverter Generator The Westinghouse iGen4500 inverter generator is a powerful, fuel efficient, and convenient solution to your portable power needs. The iGen4500 also has remote start, push-button start, and an LED display that lets you see the estimated remaining runtime, the power output, the volts, and fuel level. The iGen4500 features a compact design and an extendable handle, making this model much easier to transport than traditional generators. It features 120-Volt 20A household outlets, a 120-Volt 30A (TT-30R) RV-ready outlet, and built-in USB ports. This generator has variable engine speed and can run for up to 18 hours on 3.4 gallons of gasoline, saving you from repeated trips to the gas station. The iGen4500 also comes with a 3-year warranty and lifetime technical support. iGen4500 Portable Inverter Generator is rated 4.4 out of 5 by 797. Rated 5 out of 5 by Timbo from Nice features and much cheaper than a Honda Just what I was looking for. Started on first try and much quieter than other generators I've used. Haven't put it under heavy load yet but looking forward to seeing how it handles the ac on my camper. Rated 5 out of 5 by Fran from Quality all around! From the second I opened the box to the first push of the remote starter, I knew this was the generator that I expected. Smooth, quiet, and all the power I would have wanted. Very glad to have researched and found this machine. Thank you! Rated 5 out of 5 by Dave4585 from Awesome Generator Bought this generator about a month ago and have enjoyed it. Works great and delivers the power I need to run my travel trailer. Remote start is a plus overall just a great power provider. Rated 5 out of 5 by HomeDepotCustomer from Excellent!... Excellent! Rated 5 out of 5 by Dustin from Have only used a couple times in test runs on... Have only used a couple times in test runs on the camper. So far, it is awesome. Starts right up, runs smooth, powers Everything at once including AC. I’ll update review if anything changes. Rated 5 out of 5 by GENE from easy right out of the start up. 10 minutes out of the box i was running my AC, Frig, Lights, Fans, TV in my 35' RV! super quite! this is a champ inverter! . i did alot of research and believe i found the one! Rated 4 out of 5 by P&JF from Pretty quiet Just got it so haven’t had much of a chance to use it. Starts great and is quiet.